Pack your bags, load the kiddos (or BFF’s), fill up the gas tank and hit the open road for a summer adventure. There’s no need to stay at the typical budget motel off Highway Nowhere when you can set up camp in a cool and unique accommodation along the way. Instead of spending hours planning every detail of your trip, we’re here to help. Check out our guide of the coolest hotel rooms to sleep in the U.S. and a few abroad. Ever found yourself in the metaphorical doghouse? 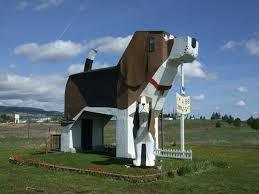 Time to get literal and stay in the world’s largest house – dog. Dog lovers prepare yourselves for all things canine. From 26 roaming beagles on the prairie, dog shaped foods for breakfast and a fire hydrant bathroom, Dog Bark Inn pulls out all the barks for your stay. Sleeping in a hollowed out dog sounds fun, but what about letting your pets sleep with you? For security and warmth, having your pet sleep join you in bed can be your comforting go-to at home and when raveling. Find out if Fido could affect your sleep routine. 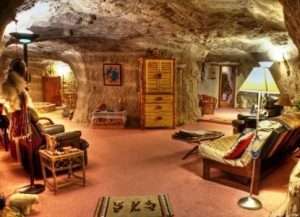 Want to spend a night like the Flintstones? The caveman suite might be the perfect spot for you. Get ready to dive down 68 ft below the surface into this fully furnished modern dwelling. With a “360-degree view of cross-bedding, petrified and carbonized wood and plant fragments,” according to the hotel, this is a geologists dream. Similar to this hotel cave, mattresses have been around for about 10,000 years. Back then straw, leaves and grass made up the beds. Fast forward to 2016 and there’s countless choices for your mattress. Find out the history of your mattress. 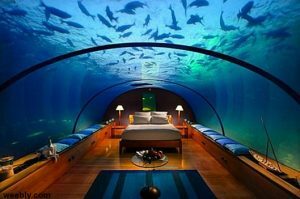 Ready to sleep with the fishes? Pack your scuba gear and submerge yourself into the world’s first underwater lodge. To reach the hotel room, you’ll dive down 21 ft to reach the lodge that also served as a research lab. Check out the 42” round window looking into the Emerald Lagoon filled with barracudas, reef fish and snappers. The next interesting hotel room to sleep in is a historic ship with some spooky stories. During World War II, the Queen Mary, transported more than 750,000 military personnel, including Winston Churchill. 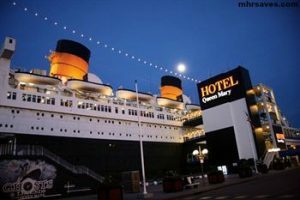 Today the Queen Mary is open to all as a hotel, museum and dining destination. The ship also supposedly benefits (or suffers, depending on how superstitious you are) from a severe infestation of ghosts. Some of the most commonly reported spooks include a lone dancing lady in a fancy white evening gown and a little girl holding a teddy bear. Sounds fun, right? Ensuring a good night’s sleep while staying in a hotel room can be difficult – especially between ice machine grinding and footsteps thumping in the hallway. Check out our hotel survival guide to maintain your sleep routine while traveling. All aboard! 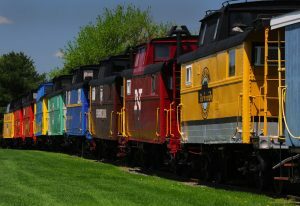 Nestled in the heart of Pennsylvania Amish country, a unique experience is waiting for you on historic train tracks. You’ll stay in a caboose car, while enjoying old-fashioned food from the Red Caboose diner. It can be difficult to re-create your sleep sanctuary while traveling but it’s possible. Some of your travel accessories can be used as sleep aides, whether sleeping under the stars or in a train car. If you’re planning an adventure outside of the US, consider these interesting destinations for your next getaway.